Apple co-founder Steve Wozniak has set off on his Woz Live tour across Australia and New Zealand, revealing why Steve Jobs liked secrecy, why he thinks computers should be able to interact with humans, how he feels about leaving Apple and what he knows about the iPhone 5. “Then there’s the engineer that’s special, like an inventor Those types take risks. When I came up with the colour formula to deliver colour with a $1 chip, it was very risk taking. Would it work? It had never been in a book,” Wozniak continued. “Now the iPod wasn’t let out until it was so obvious that this was an extreme step different to everyone else’s music player,” he said. 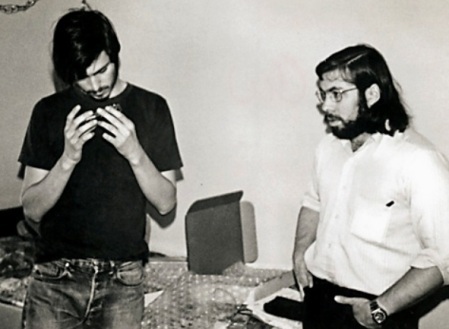 The way they were – Steve Jobs (left) and Steve Wozniak (right). “I’d like a programming language like Applescript on my iPad, but no, no no. There are a lot of things about the closed-ness of Apple I don’t like, and wouldn’t do myself. But obviously there’s a lot of quality to the products. If making it open wouldn’t make the quality the same we want to make it, I’d say keep it closed,” he said. “I left Apple, did a degree under an assumed name – Rocky Racoon Clark – and I love startups; I love what we were at Apple when there were three or four of us. So I left Apple to start up the first universal remote control company. The big company thing isn’t for me. I’ll be an engineer forever,” he concluded.